Held at one of the most opulent colleges in Mumbai, the team at Seventy EMG transformed St Xavier’s College into a whimsical fairytale fort which was a perfect setting for the Lakme Fashion Week Grand Finale! 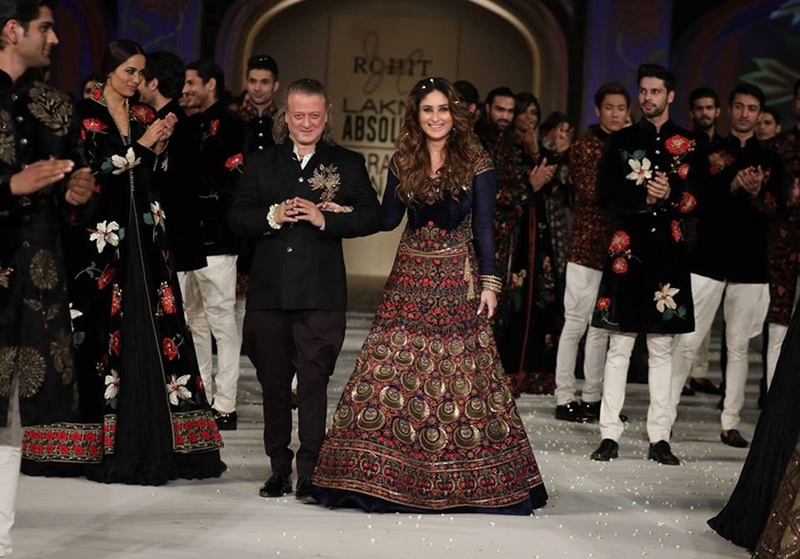 Rohit Bal showcased his latest collection which left us absolutely stunned! The motifs, the materials and subtle shimmers but all in all, the concept behind each out was just plain brilliant! No flowers, props or massive structures were used to make this grand finale, grand – just truck loads of light projections that crawled up the walls of the opulent St Xavier’s College creating a magical ambience. From falling flowers that created a fort to white hued lights that sketched the outlines of the magnificent structure – the lighting itself transformed this historic space into a work of art! Rohit Bal is in to change the bridal and grooms wear game and how ~ He used gold and white crochet lace in lehengas, sarees and stylish jackets for grooms and we were in love. But the floor-length capes with a certain metallic feel were definitely our favorite! Brocades and velvets dominated in the navy hue to bring in a royal vibe. High empire waists and flowy lehengas with defined necklines and intricate gold sequins and bead embroideries were absolute perfection. But that double broacade flare? Genius. Grooms, rejoice! There’s more to wedding wear than that textured cream sherwani thanks to Rohit Bal. Bringing in front zipper embroidered jackets and button-down sherwanis with gold floral patterns, you are sure to make a statement like no other in those! While he kept groomswear minimal, he brought in heavily embroidered lehengas and statement floor-length jackets for the chic-modern bride. Even though the palette of his collection was full of regal whites, golds, blacks and silver – Bal added a touch of color with the inclusion of floral prints and embroideries in jackets, lehengas and sherwanis. Even though most of this collection is more for evening wear, these creations in pretty silver silks with white lace brought a fresh feel to the evening. Brilliant groomswear inspiration right here! Ever since we watched her as Poo in Kabhi Khushi Kabhi Gham, Kareena Kapoor Khan has stolen our hearts completely. And this beauty as Rohit Bal’s showstopper? It was like a match made in heaven ~ Dressed in a flared navy blue floral velvet lehenga with loose flowing curls, Kareena was a beauty to behold! But the highlight of this stunning outfit were the chaand motifs – absolute artistry by RB!